My cousin has a vintage shop on Etsy.com called SunnyDayRainyDay and she’s got all sorts of great stuff for sale. 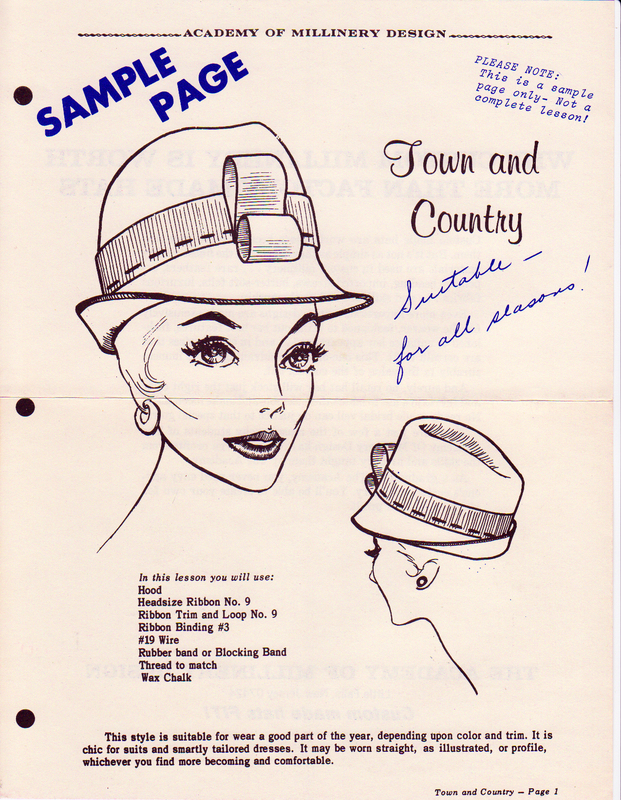 Many moons ago, she sent me some vintage millinery catalogs and I spent an entire evening pouring over them with a glass of wine. What fun! 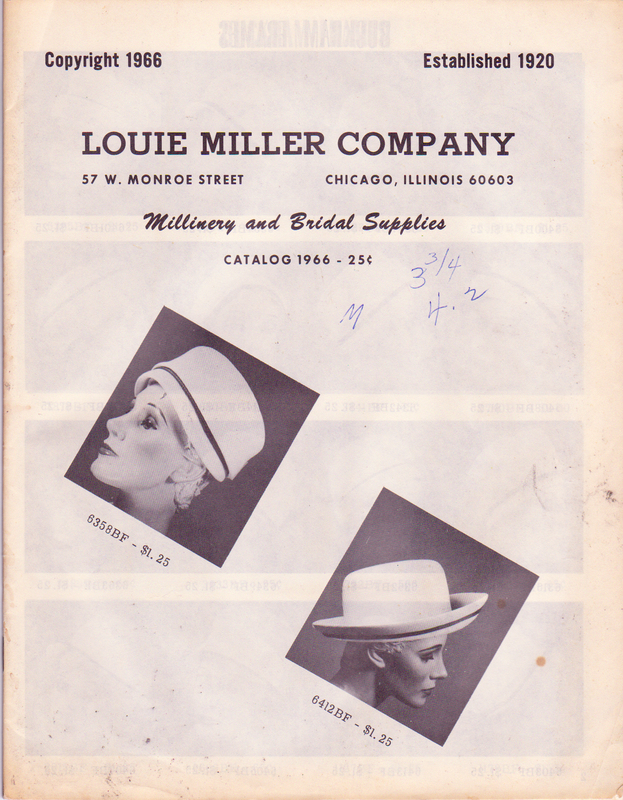 One of the catalogs is from Milliners Supply Company here in Dallas, Texas and the others are from Louie Miller Company in Chicago, Illinois. 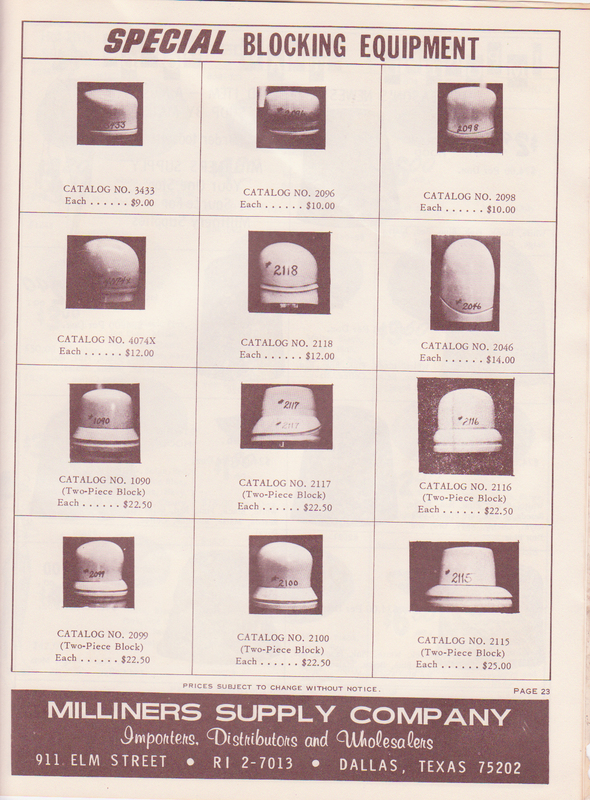 The dates range from 1960-1966.
page with "Fancy (Cape) Net Frames"
The vast majority of pre-blocked hats were buckram frames just waiting to be covered. 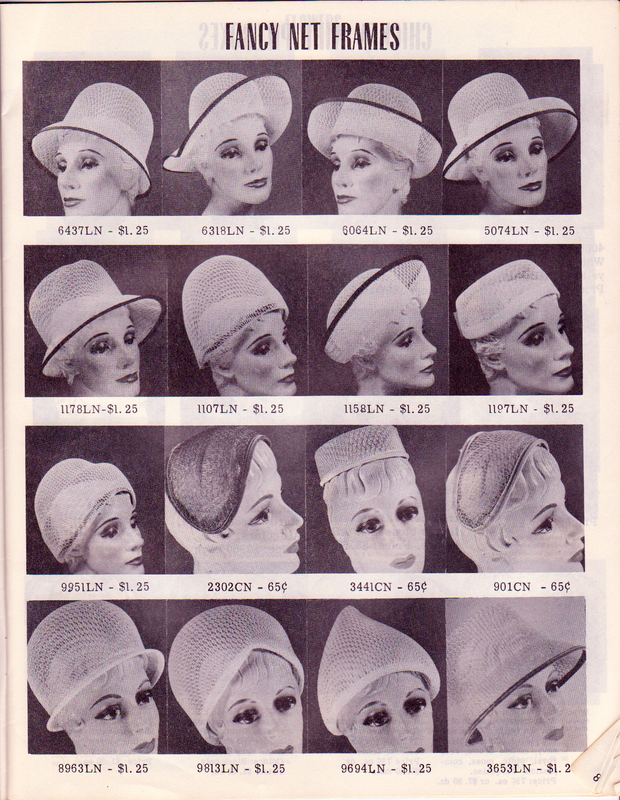 I just thought the cape net frames were more interesting since it seems harder to find cape net in today’s millinery. I sure would love to have seen the finished, covered hats! more Fancy (Cape) Net Frames - note the comment that these are "Primarily made for solid flower hats. A must for your spring wardrobe." 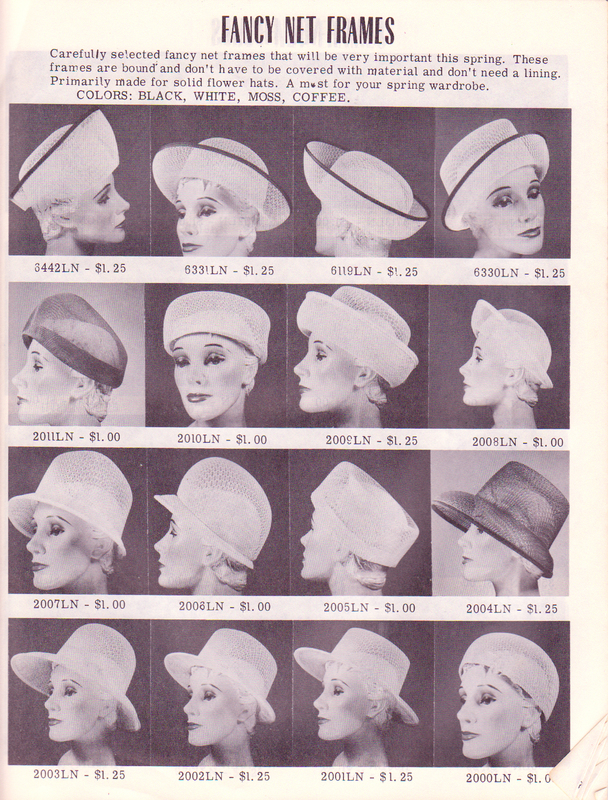 It's hard to believe how many solid flower hats were sold in the 1960s!" 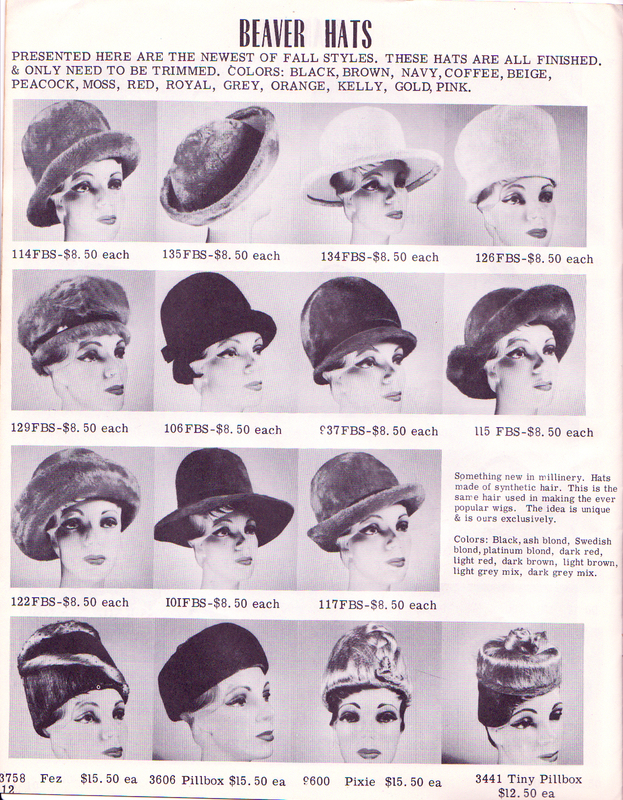 Note the cost of the beaver hats — $8.50 in 1966 is roughly $58.11 today. My, how times have changed! I suspect, though, that the low price was influenced by the fact that these were synthetic beaver as opposed to real beaver fur. What do you think? #6318 and #6327 are my favorites! My goodness! A block that cost $22.50 in 1966 would be roughly $150 today. That’s actually quite a bargain for both a crown and brim together. 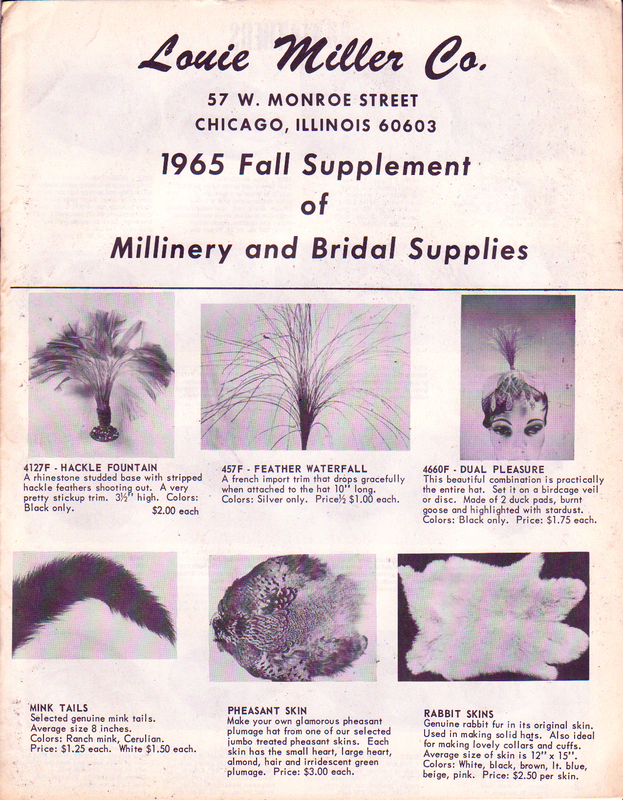 The following two photos are the front and back of a flyer that was stuffed in the middle of one of the catalogs. 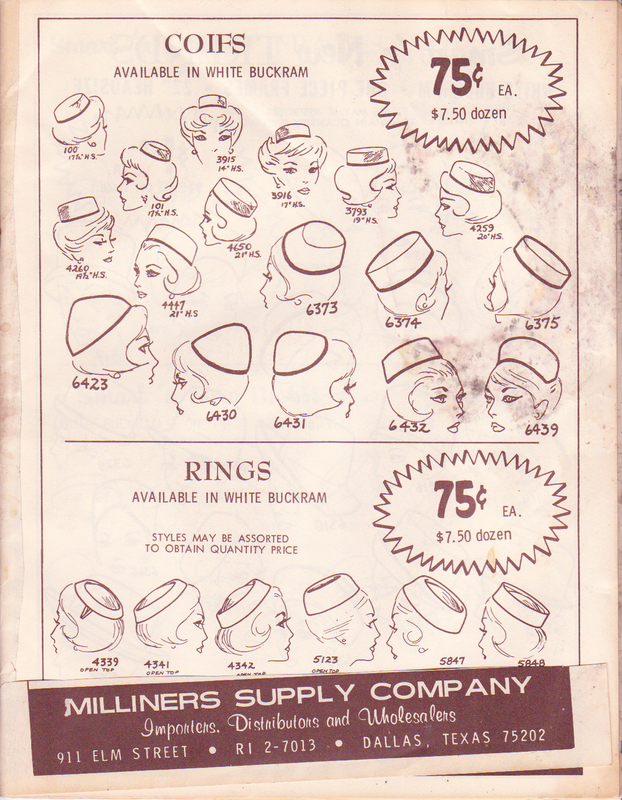 Apparently, one could learn millinery by mail order in the 1960s. The reason she encouraged me (more than once) to read the book? Because I am a whole-brained person who has found support for my viewpoint to be quite lacking, to say the least, for most of my life. 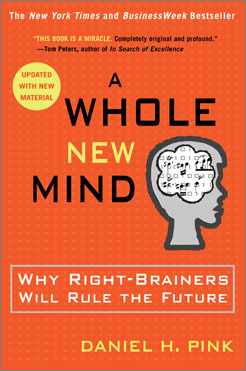 Written in 2005, the premise of the book is that right-brained and whole-brained people — people who are equal parts left- and right-brained — have been widely disenfranchised and ignored by Western society largely because of a bias on the part of science in favor of left-brained activities. This scientific viewpoint has failed to recognize that every human uses both parts of the brain to function and each brain hemisphere has its own wisdom to impart, even the right hemisphere. Dan Pink (about whom I’ve blogged before) has made a very compelling case for the theory that we are entering a new Conceptual Age in which whole-brained people will rule the economy. We had the Agricultural Age, the Industrial Age, the Information Age, and now, according to Pink, we have already entered the forefront of the Conceptual Age and those who do not adapt will fall behind, possibly for good. While that last bit is a teensy bit frightening even to me, a whole-brained thinker, the overall concept is fascinating and hopeful. It’s fascinating stuff and one which, if you’re like me and have been called “weird” your whole life just because you see things a little differently, you should read. Once you do, you may find yourself referring back to it frequently and buying copies for loved ones. I also plan to buy an extra copy (used, from Half.com, to be eco-friendly) and donate it to my local library (a favorite hobby of mine). Yes, the book is that good. Read it today to explore a whole new horizon! You can see the full slideshow here. Enjoy! OMG, has it really been a month since I blogged?? Gee, the time does fly! Been busy with a lot more marketing than producing, which can be a good thing, though I’ve been glad to get back in the studio again this week (finally!) I just had a photo shoot with a local magazine this morning for an upcoming article about my company, Millinerium, and two other prominent milliners in Dallas. Another local publication is also doing a little blurb about my bridal line, too, so things are on the move! In between all this marketing madness, you might have heard of a little something called a Royal Wedding which I was thrilled to get up at 4am to watch and thought the whole spectacle was so much fun. (I predicted that I would cry the whole way through, but it was all so sensible that I just teared up a few times. Happy for William and Kate, such a wonderful couple.) I still haven’t made it all the way through the DVR I made of the wedding – I’ve been pausing every time there’s a hat so I can really examine it. No doubt you’ve seen all the photos of some of the more stylish hats, but of course the hats that stood out most were the not-so-stylish… or at least the controversial. 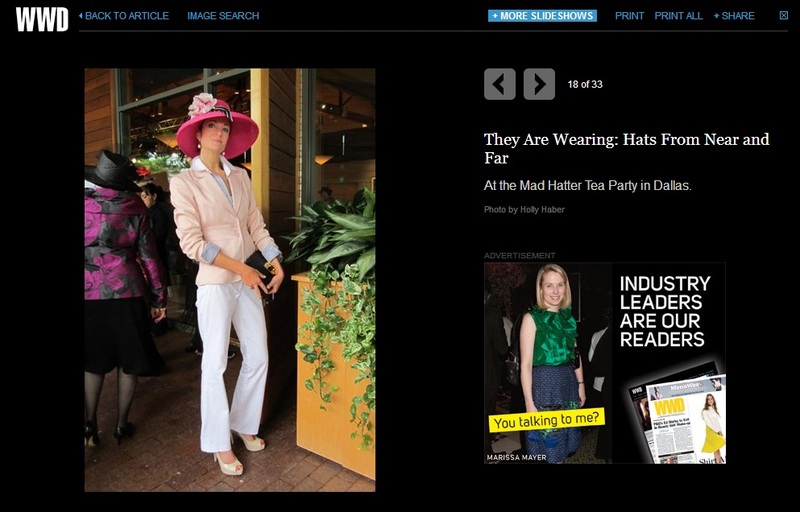 Before the wedding itself had even begun, cyberspace was abuzz about Princess Bea’s chapeau and plenty of comments are still flying around, especially in millinery circles. 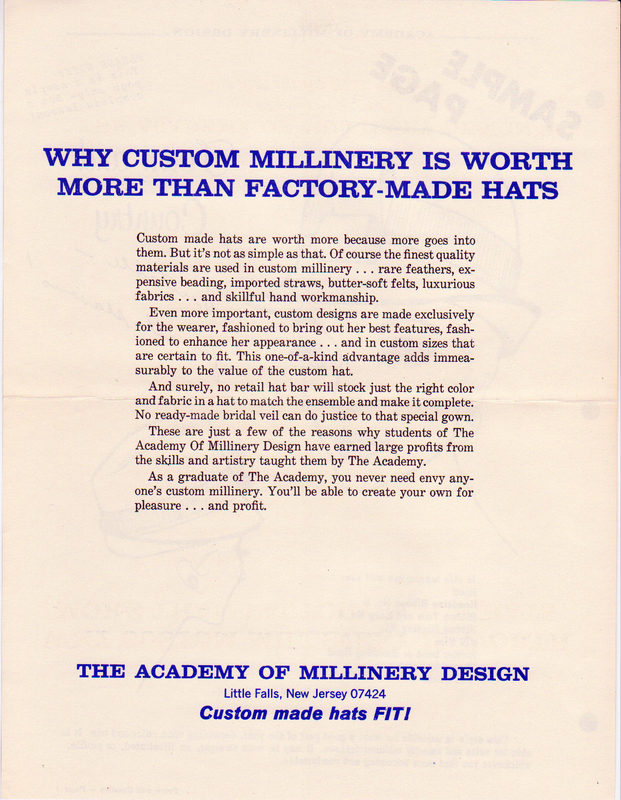 From comments I’ve read, I’d say the millinery world was about 50/50 split between like/love the hat versus can’t stand it. I personally liked it. Sure, it was a bit on the crazy side, but I love stepping out of the fashion comfort zones and ruffling feathers from time to time. 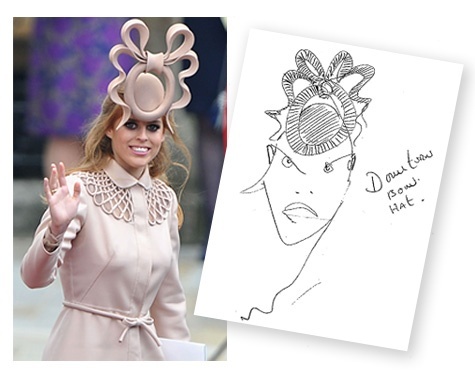 When I saw this article and saw Treacy’s initial sketch of the hat, I did find it extremely odd that he changed the scale (size) of the hat as dramatically as he did. I mean, the hat went from being a reasonable cocktail-sized hat to a monstrous octopus rising out of the ocean to swallow her head! While I find the final hat charming, I would love to hear from Treacy why the hat changed so much between concept and finished product. Did he see her dress and worry that the hat would be overlooked in favor of that busy collar? Did the Princess demand a more attention-grabbing topper? Some have speculated that she wanted to make sure she was very visible sitting behind the Queen. Others think she planned it all along to garner more notoriety – and thereby more funds – for her charity auction. What was wrong about her outfit? Everything except the infamous hat! 2. Her dress was a very unflattering color both to her hair and her skin tone. 3. The dress was lovely on its own, but next to the hat, the neckline of the dress was way too busy and competed for attention with the hat. 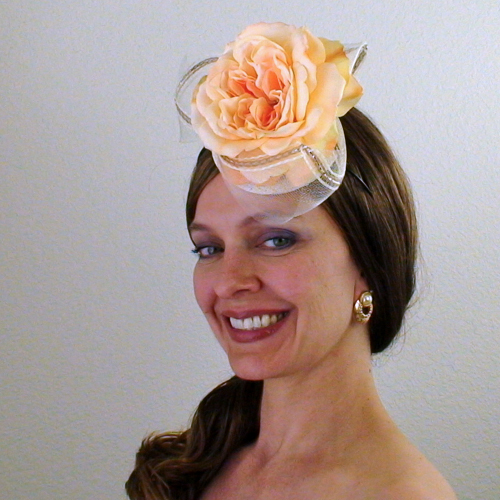 This is generally a big no-no in millinery. If you’re going to wear a showstopping hat, you are advised to tone down all other accessories and to pick an outfit that doesn’t cause the ensemble to send epileptics into fits of seizure. 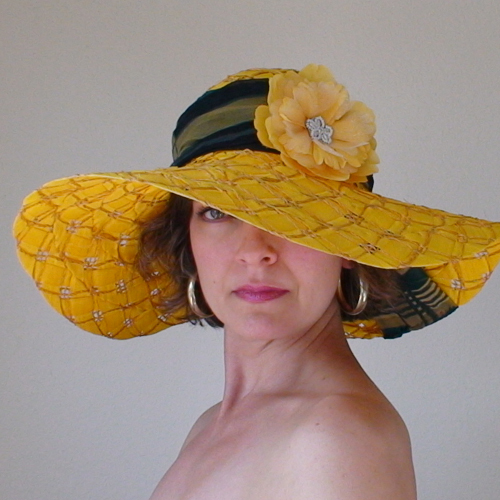 Hats are different from any other accessory because they are the first thing one sees when looking at the wearer, as they are the closest thing to the face. 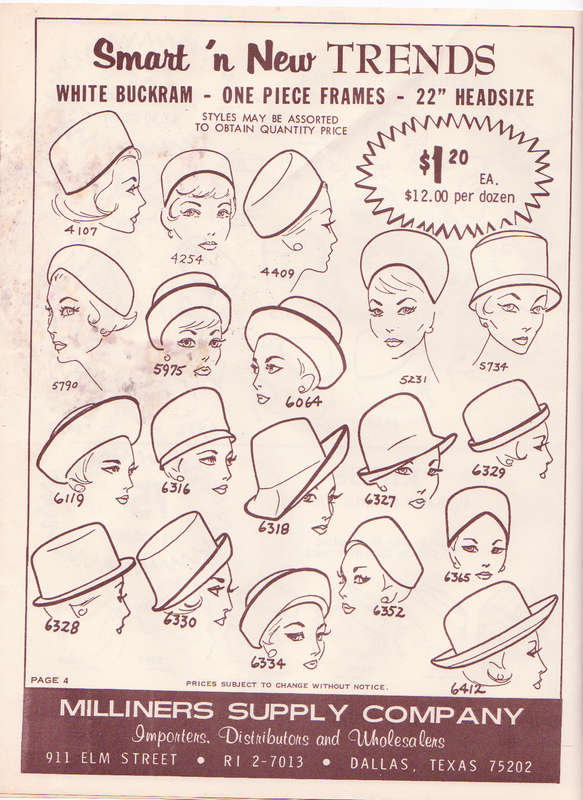 Truly, no hard and fast rules exist in millinery, in fashion, or in art in general. But there are some guidelines that will make the sailing smoother, especially if you’re unsure how to navigate the waters. The pointers above should help if you find yourself frozen in fear of becoming the next Princess Beatrice. At the end of the day, though, wear what makes you feel attractive. Take a cue from Sweet Bea: wear it with confidence and a sense of humor and it won’t matter what others think of your ensemble. I’ve been debating whether to blog about this incident or not. I heard about it a couple of weeks after it happened and have been musing over it for several weeks since. I finally decided that I needed to write about it. John Galliano, British designer with his own label in addition to working for both Givenchy and Dior, was fired in March after a drunken outburst in a Paris bar during which Galliano hurled racist and anti-semitic comments to patrons of the bar. Apparently, this was not the first outburst of this nature from Mr. Galliano. The whole incident makes me incredibly sad and conflicted, like when a kid’s admiration for a personal hero is demolished upon learning a disappointing and embarrassing revelation about that hero. It reminds me of a discussion I had in college with my sculpture professor about separating the artist from their art. I had mentioned my displeasure at Picasso’s art in connection with his abhorrent treatment of women; my professor questioned my rationale but never offered his own perspective (he was a big fan of the Socratic Method). I am better able to separate the artist from their art now, but it still stains my enjoyment of the art when the artist displays such an odious personality flaw. I suppose it’s a very human trait that makes us want to like those who produce the things that we enjoy. Or maybe it’s because I’m a woman and we’re raised to act nice and expect everyone else to follow that code. Either way, it’s frustrating to me that someone as talented as Galliano would not only hold such repugnant personal beliefs, but then would loudly vocalize those beliefs in public – more than once! 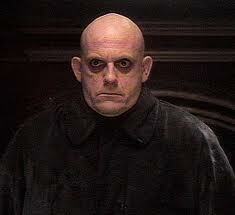 I guess it’s good that at least we know he feels that way, rather than him hiding his prejudices…. So, I wanted to throw this out there to see how y’all feel about it. Do you feel good about Dior since it fired Galliano? Does Galliano’s behavior disgust you? Should it matter what a designer’s personal beliefs are? Do you separate business from politics? Or do you show your support with your purse, boycotting when something upsets you? Would love to hear from you if you’ve got any comments. Below are some of the tragically beautiful designs from Mr. Galliano’s collection upon the eve of his dismissal from Dior. If you’ve looked at my website, you know by now that I produce headwear with an emphasis on environmental sustainability, a.k.a. Eco-friendly headwear. I’ve been a nature girl my whole life, and an environmental steward in ever-increasing intensity for around 15 years now. Producing eco-friendly headwear provides special inspiration which has led to wonderful new creations, as well as challenges that have, on occasion, made me question the wisdom of attempting to produce such a high-maintenance line. However, my giddy feelings of “bonus points” when I do right by the environment spur me to continue on this path and figure it out as I go, rather than needing to know up front how it will all work. I just have to trust that it will work out, one way or another. I’ve been saying for a while that environmentalism isn’t black and white – it’s usually a “lesser of two evils” situation where you must make your best decision (hopefully an informed one) and then trust that it will work out (there I go again). The deeper you get into the environmental movement, the more you learn that everything really is connected and impacts everything else. The fair trade/fair wage movement is tied to environmentalism for this reason, as are the slow food and slow fashion movements. I’ve been particularly interested in the role of sustainability in the Arts, and, so far, I haven’t really come up with many good answers. (It’s also been hard to find other artists to engage in the topic.) Above all else, I’ve learned that in order to be a good environmental steward, you actually have to let go of perfectionism. This seems paradoxical but it’s true; the more we indulge perfectionist tendencies among eco-awareness, the less flexible and more militant we’re likely to become. This goes quite contrary to what nature herself does (go with the flow) and it’s a good principle to learn from nature. I do my best to remain mindful of ways to incorporate eco-friendly elements into my headwear and I feel especially good when I’m able to produce a hat that is almost completely sustainable. At the end of the day, if I’ve done the best I can to stay eco-friendly while still nurturing my creative vision, I’d say I’ve done pretty well. Earth Day 2011 approaches once again (April 22). As the media begins its yearly Earth Day blitz, take a moment to think about how these issues impact you in your work life and at home. It’s a difficult subject when you get down to it, but it feels good at least to be trying to make a positive difference. I would love to hear your thoughts – even your rants if you’ve got ’em! – about environmentalism. I may agree with you, I may not, but simply starting the discussion is truly a great beginning. I just discovered Arturo Rios this week and have to share him with you. This is a quick and dirty post as I’ve got to join my husband in a meditation class shortly, but I haven’t blogged recently so I’m throwing some eye candy your way. Arturo has a great balance of classic and avant garde, all of which I love. I’m sure I’ll draw inspiration from some of his shapes and techniques in my own works at some point. Every time I encounter avant garde fashion it makes me happy because it reminds me that when crazy designs spring from my mind – designs which I don’t always understand yet feel like I must make – they do have a place in fashion and can find a home with the right hat lover! I especially love this hat since I’ve been working with bird wing shapes on my hats, too! Hope you enjoy theses great hats as much as I do!